Hanoi (VNA) – The commencement of criminal proceedings against former Minister of Industry and Trade V​u Huy Hoang for his violations related to personnel reception, transfer and appointment will be implemented based on the Party statutes and State law, heard a press conference after the recent cabinet’s monthly meeting in Hanoi. 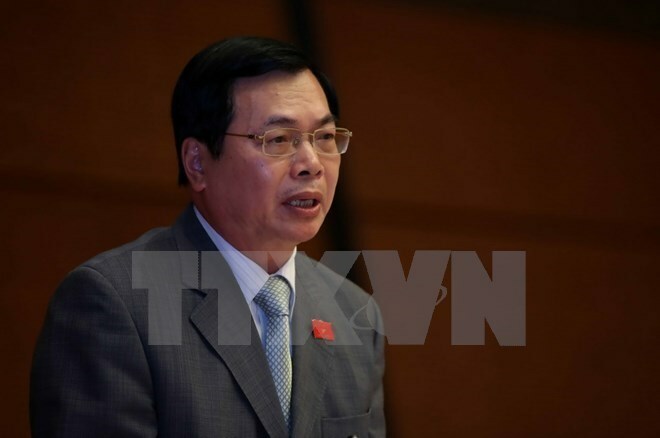 Minister – Chairman of the Government Office Mai Tien Dung said the Central Committee’s Inspection Commission had proposed types of discipline to former Minister Vu Huy Hoang for his appointment of Trinh Xuan Thanh – former Vice Chairman of the Hau Giang provincial People’s Committee. The Party General Secretary had directed the Party and State agencies along with executive and judicial bodies to look into the case for verification and conclusion of any wrongdoings, Dung said, adding that Deputy Prime Minister Truong Hoa Binh on October 25 requested the Ministry of Home Affairs and relevant agencies to continue clarifying the violations of collectives and individuals relating to the case. Minister Mai Tien Dung stressed that violated organisations and individuals will be punished in accordance with the Party statutes, State law, and the Resolution adopted at the fourth plenum of the 12th Party Central Committee. He stressed that the Party and State will take drastic measures to deal with any violations.